". 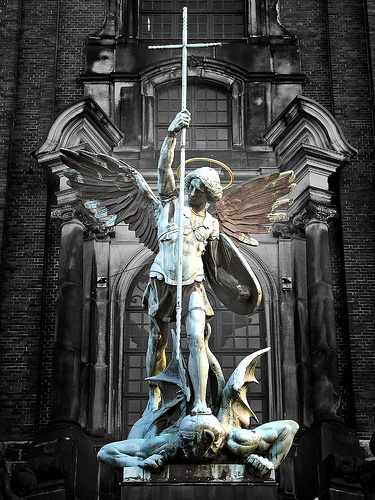 . . the time is not far off when all of you faithful people will have to TAKE UP THE ARMS OF FAITH AND COURAGE TO FIGHT AGAINST THE RELENTLESS PURSUIT OF HELL AND THE VENGEANCE OF MEN ..." (St. Michael speaking, 28th September 1880). "Next beginning of the lethal revolutionary crisis -- this is the way the voice is speaking -- this beginning will last for four weeks: not one day longer, not one day shorter; but the stretch of it will be immeasurable. The number of those called "murderers of the people" will be of an inconceivable immensity ... At the time of that terrible hour, foreigners, whose desire is full of a violence unable to retain hold of itself, foreigners will be ruling in France. Right from the news of the fatal event, their ears will not turn deaf. "During that first struggle, throughout the whole extension of France, freedom will be left for everything. No prisonsers will be arrested for their crimes: freedom will be throughout its whole extension. "A very short rest will follow after that great entrance into evil, which evil will be complete, especially at the Center [Paris] and its surroundings." (May 9, 1882, pp. 55-56, Prophecies of La Fraudais). "The second and violent crisis . . . France will be invaded up to the dioceses where Brittany begins. "The second crisis will bring everything to its climax, and among the people, only he will escape who will find a dark shelter. "[M]en of power, after delivering the kingdom to blood, are going to assemble in a place of peace and elaborate definite and decisive projects. They will seek a saviour to place on the throne of France. "Several among those great commanders of the kingdom will withdraw into a corner of the stolen land of France..." The voice says: "Alsace and Lorraine." Retired there in secrecy, they prepare their king, the one against the designs of Providence. They will really decide -- and nobody will be able to deter them from it -- to have the culprit ascending a throne which is never going to belong to him. "The second period will extend beyond a month. Without any rest nor stop for breathing, it will reach up to the thirty-seventh or the forty-fifth day. This second period will finish everything. Will be saved only what God promised to take under His protection: the places described by His word and preserved by His gratuitous bounty." (May 9, 1882, p. 56, ibid). "A foreigner will enter France with his whole army. He will walk to a length I measured Myself." (September 18, 1902, p. 101, ibid).
" 'France's enemies will not perish by earthly sword, but by the sword Heaven places in the hands of those victorious upon earth. The army the Lord has made choice of, for the glorious entrance of peace and of Henry V, that army will be inconquerable, even if the whole earth were to set up its ranks to oppose its marching: they will meet those ranks front to front and will pass through without any effort, splitting those crowds apart just like dust. Such an invincible army does not result from the will of mortal men: it is written down by Heaven's hand, established and willed by [the] Eternal Empire in the full extension of its glorious power.' " (Sept. 28, 1882, pp. 182-183, ibid). "I will stop them [the foreign invaders] and, on stopping them, I will give rise to the Saviour of the remnants of My children. He will walk across the East, and will appear like coming out from the limits of [the] North. I will lead him until South whence I will bring him back, not upon the throne of present time, since no throne will be left, not even a base on which to lay a foundation for another." (September 18, 1902, p. 101, ibid). "That wil be amidst that third crisis, that salvation will come along. Then will come out of My Sacred heart ... the one whose destiny it is to bring forth peace. With his coronation, all evils will come to an end. He is a descendant from a branch of Saint Louis, but this guilty Sodom does not possess him." (August 17, 1905, p. 101, ibid).